Can you imagine how disturbing it would feel hearing loud machine noises and heavy ground shakes nearby but not being able to see where it come from no matter where you look? Nice idea for a ringtone. And try to keep Nitori away from the Clone Wars DVDs, who knows what she might build next. Keep that design away from the Empire. 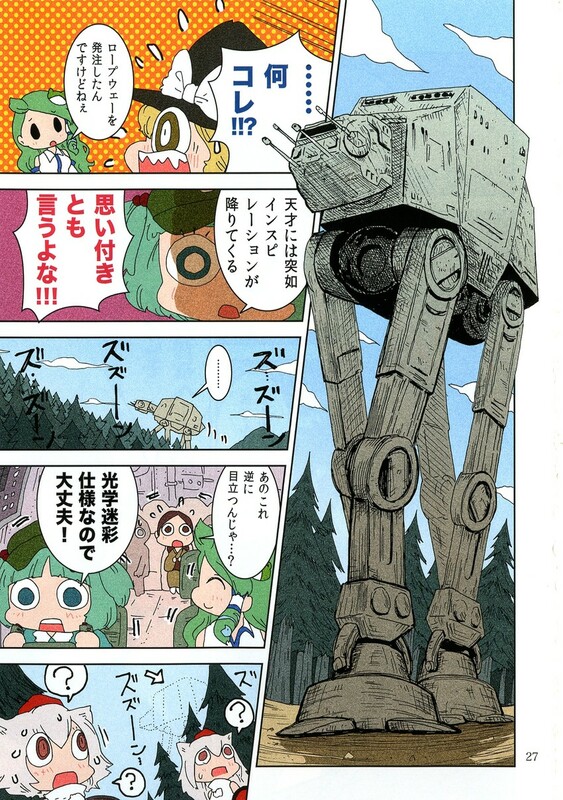 We don't need cloaked AT-ATs. You have startled the Tengus! Not even karaagetarou can figure out how you board these things. According to the Star Wars Technical Journal, that rectangle on the side of of the AT-AT's body is the main boarding hatch through which troops are loaded and unloaded. Apparently, as silly as it sounds, the mighty Imperial Walker can "kneel." It also performs standardized docking at Imperial landing platforms (as in Return of the Jedi). Inspiration strikes geniuses out of nowhere. Its been four years already? Don't worry Nitori...just another two or three years. Just say you had a whim!!! It's set up with optical camouflage, so we'll be fine! .... What the hell is this!!? Er, doesn't this stand out even more...?